This is a good organizer to teach kids how to ask different types of questions while reading. I used it with the book Tuesday. 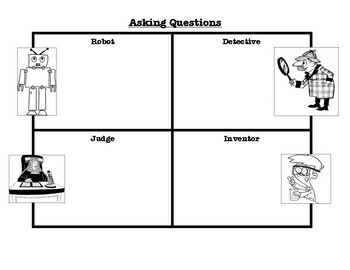 Robot questions are about characters/setting and typically begin with who, what, when, and where. Detective questions are prediction/inference questions (what do you predict?, what does the author mean? etc.). Judge questions are when students judge what is happening in the story (would you agree?, in your opinion...?, would it be better if...? etc.). Inventor questions take information from the text and apply it to other situations (how would you..?, what would you do if..?, how would it be different if...? etc. ).